DETAILS: Advance registration required. Call 732-5732. DETAILS: Advance registration is required. Call 732-5732. DETAILS: Free tote bags for donors! Please join us to donate blood at this lifesaving event in support of the central Illinois blood supply. Central Illinois Community Blood Center is the blood provider to area patients of 19 counties at 19 central and southwestern Illinois hospitals. CICBC is the only provider of blood to Abraham Lincoln Memorial Hospital, Hopedale Medical Complex, Memorial Medical Center and St. John’s Hospital. If you have any questions about donating, you can call 1-866-GIVE-BLD (1-866-448-3253). Walk-ins are always welcome, but to schedule an appointment, call Jessica at 1-866-GIVE-BLD, ext. 118, or visit www.cicbc.org. DETAILS: Featuring live music. 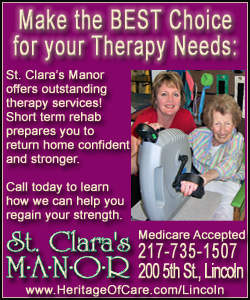 For more information, call 217-732-3519 or 217-737-8494. DETAILS: Please join us to donate blood at this lifesaving event in support of the central Illinois blood supply. Central Illinois Community Blood Center is the blood provider to area patients of 19 counties at 19 central and southwestern Illinois hospitals. CICBC is the only provider of blood to Abraham Lincoln Memorial Hospital, Hopedale Medical Complex, Memorial Medical Center and St. John’s Hospital. If you have any questions about donating, you can call 1-866-GIVE-BLD (1-866-448-3253). Walk-ins are always welcome, but to schedule an appointment, call Jessica at 1-866-GIVE-BLD, ext. 118, or visit www.cicbc.org.